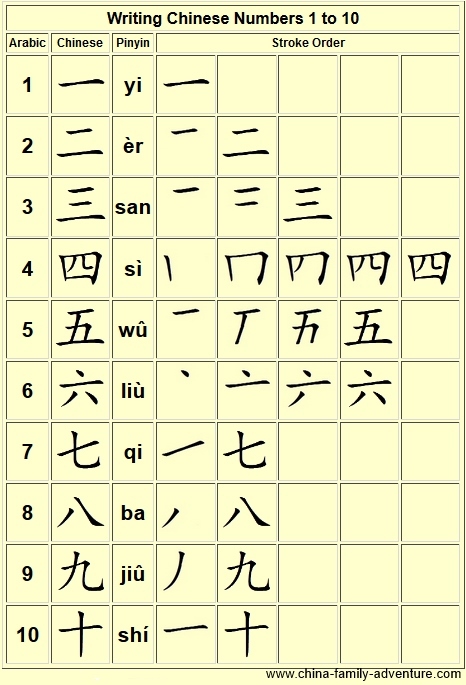 Writing the numbers in Chinese is simple as most characters are made of few strokes. Although the basic Chinese Number system is used widely, the Arabic system (what we are used to) has also been adopted due to convenience. Prices at the stores for example, are also quoted using the Arabic system. 1 yi . . . .
2 èr . . .
7 qi . . .
8 ba . . .
9 jiû . . .
10 shí . . . When the number comes AFTER TEN, you ADD it to ten. When the number comes BEFORE TEN you multiply TIMES ten. If the number goes AFTER ten, you add it to ten. If the number goes BEFORE ten, you multiply times ten. Using these two simple rules, you can get to any number up to 99. Next: Counting to 1,000,000 and beyond!